ARTIFACT: This is a scarce early World War II Curtiss-Wright �100%� pin. Curtiss-Wright began in 1929 when Curtiss Aeroplane and Motor Company of Buffalo, New York, and Wright Aeronautical of Dayton, Ohio merged. 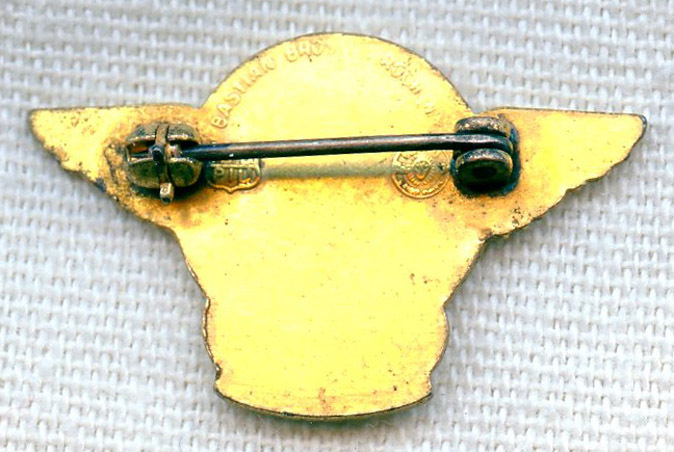 The pin is a petite wing by Bastian Brothers of Rochester, New York. SIZE: Approximately 5/8� in height and 1� in width. CONSTRUCTION/MATERIALS: Gold-plated brass with painted areas. MARKINGS: BASTIAN BROS. ROCH., N.Y., union marks. CONDITION: 8- (Very Fine-Excellent): The pin shows some very small spots of light wear.